Welcome to Brickipedia! This guide gives some basic information about the conventions and layout of our content articles (also known as the "mainspace"). Also below are some basic pointers with wikicoding. It may seem like there's a lot to learn with how to use our templates and if you don't know any wikicode, it may seem a bit daunting to learn, but don't let that stop you! If you see something that you want to improve, please go ahead and do so. Most of our users are more than happy to help you out with any questions you may have and will fix up any formatting or coding issues, so you can learn the conventions and basic coding as you edit. All articles should use correct spelling and grammar. Articles should be based on fact, not personal opinion. But if you wish to give your opinion about a set, you are more than welcome to write a review or discuss in the forums. Different types of articles (set articles, minifigure articles, etc.) have different types of layouts and rules. You can read about them all in our Manual of Style. These articles generally each have two types of special templates- an infobox (a template you usually see on the right-hand side of the top of the article) and a navbox (a template you usually see at the bottom of an article). These templates you should use on a specific type or article are linked to in the relevant sections of the Manual of Style. Going to the template page will provide you with some instructions on how to use the template. Writing and editing an article for the most part is very simple- you type information into a box just like you'd type anything else. However, there are a few extra things that you can do to make an article look better or the content to be more helpful. Some examples are below. Text I am a minifigure! I am a minifigure! Italics ''I am a minifigure!'' I am a minifigure! Bold '''I am a minifigure!''' I am a minifigure! Bold Italics '''''I am a minifigure!''''' I am a minifigure! This is an example image. Bold and italic text- if you want to change the style of a word or a group of words, you can surround them with groups of single quotation marks ('). Groups of two quotation marks will produce italic text, while groups of three will produce bold. For example ''This is italic text'' produces This is italic text. Headings- Articles on Brickipedia generally have two types of headings, level two and level three headings. Level two headings are used for main sections in articles, while level three headings are used as subheadings. An example of a level two heading is the large "Basic wikicode" text which is used above to start this section. It is produced by the code ==Basic wikicode==. As you can see, it uses two = signs on each side of the text. If you wanted to make a subheading, you could use three = signs on each side. Links- To link to another article, sets of two square brackets are used. For example, if you wanted to link to the main page, you could type [[Main Page]] which would produce Main page. If you wanted to link to a page but for the link to say something different, you can use the pipe character (which you can type by holding "shift" and pressing the backslash key, which is usually above the "enter" or "return" key). For example, [[Main page|hello]] produces hello (note that this still links to the main page). Images- To make an image appear in an article, you use the following code: [[File:filename|size|(position)|(thumb)|(caption)]]. The parts in brackets aren't always needed, and you can leave them out. 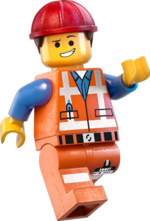 However, and example of an image using all of these is the picture of Emmet to the right. It is produced by using the following code: [[File:Emmet.png|150px|right|thumb|This is an example image.]]. If you want to have just the image and no caption, you could use [[File:Emmet.png|150px|right]]. Images are generally measured in pixels here, therefore the sizes for images are generally done with 'number'px, as you can see in the previous code, the image is set to be 150 pixels wide. If you know any HTML code, most of that will work here (there are some exceptions, such as the <a> tag). If you don't know any HTML, don't worry, it's generally not needed in articles. These are just a few tips to help you out, but if you have any questions about this or anything else in regards to editing, please don't hesitate to contact an administrator on their talk page or start a help thread in our forums. Facts about "Guide to editing"
This page was last edited on 25 February 2018, at 03:21.